On April 2008, ELEKTOR magazine published an article about an Internet Radio based on Nut/OS. In November 2008 it had been presented at the Elektor Live Event in Eindhoven (Youtube video on the right). Click on the picture to get a more detailed view. The firmware is published under the permissive BSD License, which allows incorporation into proprietary products. The CAD files of this open source hardware design are released under a similar license. 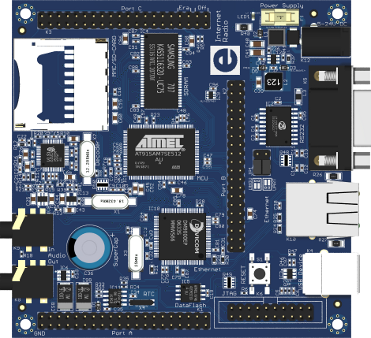 Atmel AT91SAM7SE512 ARM7 CPU with 512kBytes high speed flash and a wide range of peripheral functions. Atmel AT45DB321D 4MBytes serial Flash. VLSI VS1053B Audio Decoder supports MP3, AAC, WMA, Ogg Vorbis, WAV and MIDI. Philips PCF8563 Realtime Clock with double layer cap backup. Wide range (5-24V) switching power supply. You can order fully tested and pre-loaded boards from this online shop or other distributors. Right now there is no user interface hardware (LCD, pushbuttons etc.) available. However, all CPU ports are accessible via three 2.54mm pinheaders, which may be used by an expansion board. 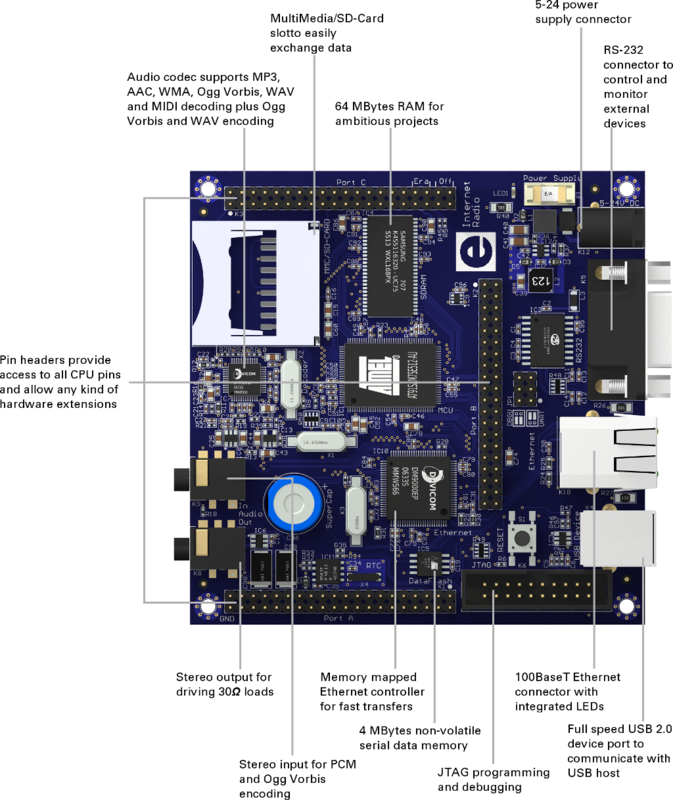 Brief overview and schematics of the EIR 1.0 Rev-C Board. Free for non-commercial and commercial usage. egnite shipped the first boards with SMD parts mounted only. Today the boards are fully mounted. Firmware for testing EIR boards. Check the project page at SourceForge for the latest release. contain the complete source code as well as a ready-to-run binary. If you are working on another platform, then get the source code from the Subversion repository. To build the firmware from the source code, Nut/OS 4.10 or any later release is required. Due to the lack of any user interface hardware, the radio runs an internal web server. This page shows how to monitor and control the Internet Radio with a web browser. Explains how to upload new firmware to the EIR board. This is the most simple way, but requires a Windows PC. Describes how to use the EIR with OpenOCD. This is supported on Windows, Linux and Mac OS X and offers an alternate method of uploading new firmware. Presents several flash movies for trying out the EIR. explains how to setup Eclipse and OpenOCD to allow source code debugging of Nut/OS applications running on the Elektor Internet Radio. How to configure and use the memory card socket. How SPI is implemented on the EIR board. How to use the EIR as an audio recorder. Provides additional hints for attaching external hardware. Problem: The first kits shipped contain a wrong RS232 connector (K5). A male connector is required, but a female one had been packed. * Replace the female connector with a male type. If you don't have one available, send an email to info at egnite dot de. You'll receive a replacement free of charge. * Removing an already mounted connector isn't easy. As an alternative you can make a special cable which will work with the wrong connector. 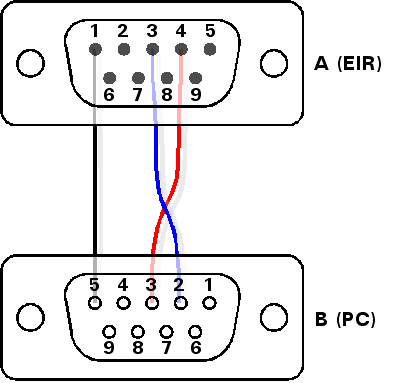 Click on the picture on the right to get the wiring schematic. Note that the cable plugs are shown in front view, with cables soldered on the back side. A so called Gender Changer should work too, when used with a Null Modem Cable. * Another option is to send your board to egnite GmbH. Your connector will be replaced and your board will be tested and returned immediately, free of charge. Please do not forget to use the shielded bag to pack the EIR board. Problem: The CD Version 1.1.1 links to the wrong firmware source file, webradio-1.2.0.zip. This source fails to compile. Solution: The CD folder firmware also contains the correct file webradio-1.2.1.zip. In table 1 it is stated, that PA20 at pin 21 of connector K1 is used for MMC DAT2. Actually this signal is additionally used for the Ethernet controller chip select. In table 2 it is stated, that PB22 at pin 23 of connector K2 is used for the DataFlash chip select. Actually the chip select is at PA11. PB22 is not used and available for external hardware. In table 3 it is stated, that PC23 at pin 24 of connector K3 is used for the Ethernet controller chip select. Actually the chip select is at PA20. PC23 is not used and available for external hardware. Monthly magazine, not only for hobbyists. Atmel is the company that manufactures the AT91SAM7SE512. Under Tools & Software you'll find the file AT91-ISP.exe. Use this tool on a Windows PC to upload new firmware to the radio. The website of VLSI Solution Oy, who offers the VS1053 audio codec. Michael Fischer offers a complete package, which allows you to create your own applications for the radio board. Of course you can also use YAGARTO to compile the radio application source code. Erfahrungen und Methoden zum Elektor EIR: Christian Schöning created a document about how to use the EIR with Eclipse (German language). EIR pages of the Computer Engineering Laboratory at the university of Oulu.